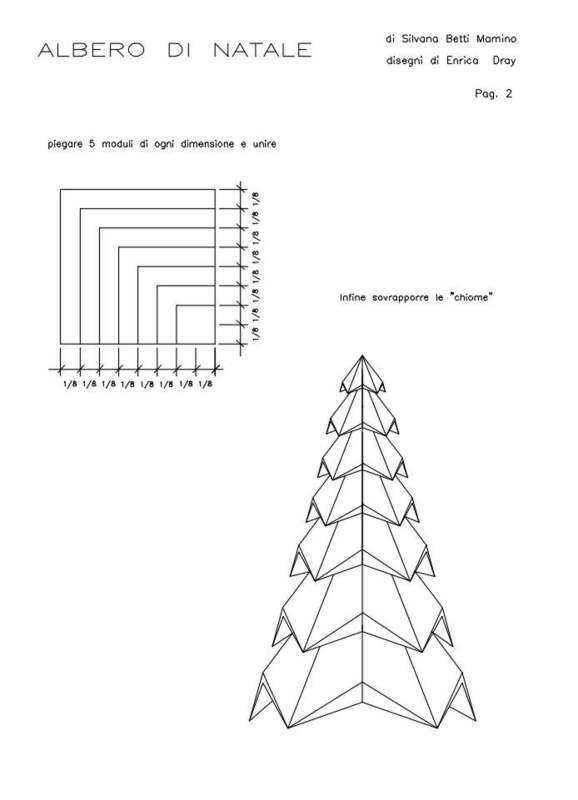 This page is a "help page" for folding the origami Christmas Tree created by SB Mamino. The diagrams are abbreviated and some steps are not shown; this page goes through the steps in greater detail. The original design consists of 7 tiers (layers). Each tier is made of 5 units. Each unit starts with a square sheet of paper. 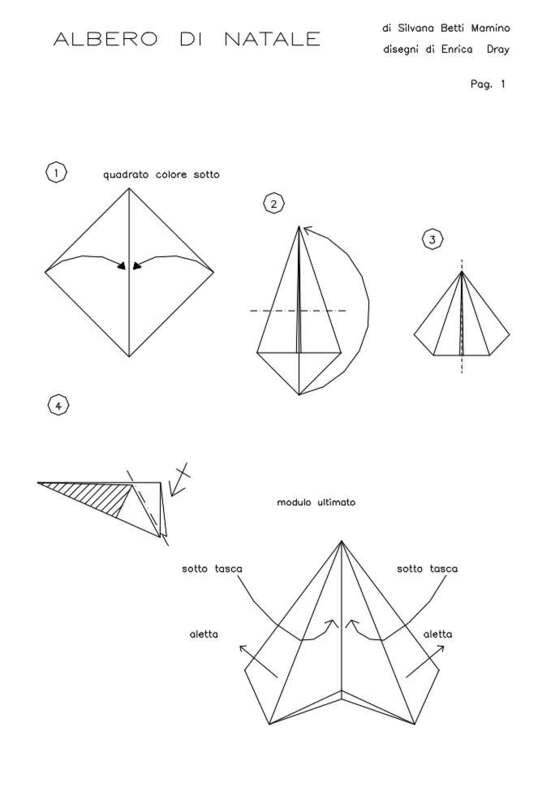 You can use origami paper, but paper that is colored on both sides is a bit better because then there is no white-side peeking out. Mamino recommends using paper squares that are successively 1/8th smaller than the tier below. If you are using larger sheets of paper and need to cut them to size, a good size to start with is 4.5 inches (12 cm) wide for the largest tier and 1.5 inches (3 cm) wide wide for smallest tier. It gets difficult to fold squares smaller than 1 inch. The resulting tree will be about 7 inches (18 cm) tall. If you already have square sheets of paper, you do not need to measure their sizes with a ruler. Simply make pinch folds to find the 1/8th divisions. Then trim off the paper around the edge to get smaller and smaller sheets. Step 5: Mountain fold in half. Relax the folds a bit. Make 5 units of the same size. There should be a total of 35 units. Assemble the units into tiers (levels). Place two units side by side, insert the flap of one unit into the pocket of the other unit. There is no lock for this model; friction keeps the two unit together. To help keep the units together, you can fold the small triangular flap over the larger flap from the adjacent unit. Assemble all 5 units in the same way. Insert the flap of the first unit into the pocket of the 5th unit. The model will become 3D like a cone. Make 7 tiers of different sizes. Place the tiers one on top of the other with the largest cone on the bottom. Be careful, the layers can tip over!